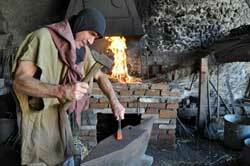 Experience the unique opportunity to witness an authentic replica of a medieval castle in the making at the Ozark Medieval Fortress in Lead Hill, AR. Witness first-hand how the authentic strongholds of the past were built using manual labor and bare hands. 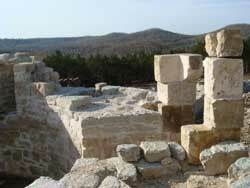 See how they were constructed using forged tools, felled trees, and quarried stones. This is an interesting, educational, interactive and fun experience for the entire family. You will be transported deep into the forest, back to the year 1000, and will interact with the workers dressed in period clothing. This unique exhibit is an outdoor laboratory of a living history book as a talented team of architectural experts work together with historians and artisans to recreate a full sized castle from the middle ages. 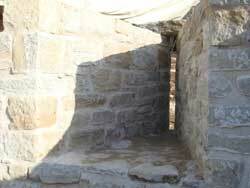 The incredible fortress will include a working drawbridge, 24 foot high, six foot thick walls and 60-foot towers. All this work will be performed without the use of modern machinery. Inside the protective walls is an expansive courtyard. Work on this project will continue for 20 years, the time that was required to build such a fortress in the Middle Ages.